While Trump ended the year by blasting on Twitter about global warming being fake news, China decided to ring in 2018 by taking an important step in cleaning up its transportation system. Beijing announced that effective as of January 1st 2018, over 500 car models that failed to meet the country’s fuel efficiency standards would no longer be manufactured in China. The full list of banned models has not been made official yet, however Bloomberg reported that the list includes models from domestic manufacturers like Dongfeng Motor Corp, and international giants like BMW, General Motors and Volkswagen. Notably, the new ban is only expected to impact a small portion of China’s total car market, at most 1 percent. 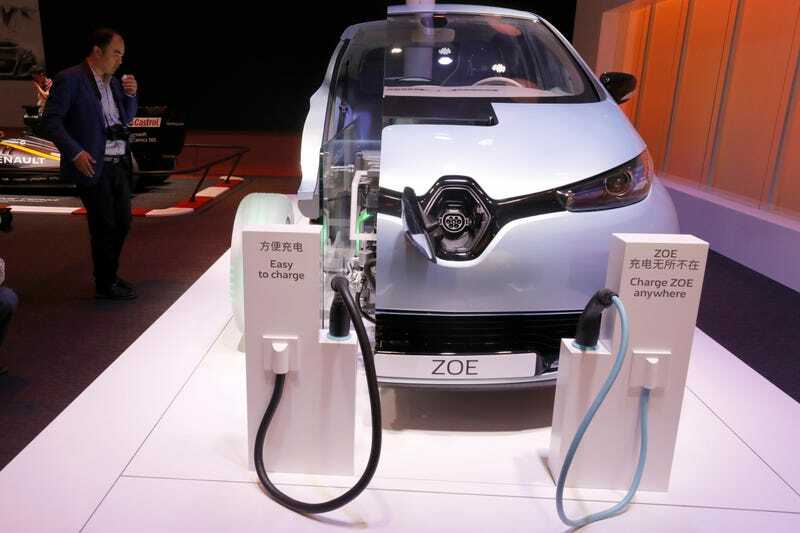 Still, as China is the world’s largest automobile market, with over 28 million vehicles sold in 2016, even a small change send a strong signal to the world’s automakers: if they want to sell in Big Leagues, they’ll have to start thinking green. This crackdown on fuel efficiency is just the latest move in China’s ongoing battle to clean up its transportation sector. In the middle of 2017, Beijing announced that starting in 2019, all automakers in the country would need to ensure that at least 10 percent of their new car sales were electric; by 2020, the country hopes to have over 5 million electric cars on their roads; and China is setting itself up to build the largest electric vehicle charging grid in the world. And it’s not just China that’s cruising along the road to electric cars. Government initiatives in Norway have made electric cars cheaper and more convenient, so much so that in 2017 more than half of all new cars sold in the country were electric vehicles. Germany recently passed a resolution banning combustion engine cars by 2030. And across the world, sales of electric cars have been increasing. Of course, electric cars still need to get their energy from somewhere, and if they’re charged by electricity produced from fossil fuels, their carbon footprint isn’t all that better than normal cars. China gets over 60% of its energy from coal, meaning that simply transitioning to more electric cars isn’t going to solve all of the country’s climate problems. However, under the Paris Agreement China has pledged to spend hundreds of billions of dollars to shift its energy needs away from fossil fuels; the country has committed to peak its emissions by 2030, and significantly lower its carbon intensity (the amount of emissions per unit of GDP) by moving towards renewable and nuclear energy sources. So, how does the U.S. match up? It’s a bit of a mixed bag. On the one hand, gas guzzling SUVs and pickups are selling like flapjacks in the U.S., and earlier this year Trump ordered the EPA to start rolling back Obama’s fuel efficiency rules, which were meant to double the average miles per gallon for cars and trucks by 2025. On the other hand, electric cars are gaining popularity among Americans, with sales of electric and hybrid cars in the U.S. increasing by about 40% in 2017. Moreover, the $7,500 federal subsidy for electric cars wasn’t killed by Trump or by the Republican tax bill, as many conservationists feared it would be. And California, which is the largest market for cars in the U.S., has pushed forward all sorts of incentives for electric cars, including tougher fuel efficiency standards, and an array of voucher, rebate and loan assistance programs. Let’s not forget how quickly things change. In January of 2015, China and the U.S. came together to push for the planet’s most comprehensive climate agreement in history. Two years later, Trump is the leader of the free world, and China is leading the charge towards a sustainable future. Who knows what 2019 will look like.